It’s a new week, can we put the events from Saturday behind us? oh, well it was worth a try. The dust has settled only partially and many questions have been raised. The fans are still pissed (pardon my French) and want answers. How do we move on from this? We went into the game with a point to prove, that the team that turned up last year were a team in turmoil but now we have our house in order. In all honesty if Man United weren’t so wasteful they could have scored a similar amount of goals as last year. I have a few points that I would like addressed. Of course I don’t have direct contact with Mr Wenger and so I don’t expect my point to go any further than you the reader but feel free to agree/disagree. Now given the injuries we currently have to our more pacy options in the wide role such as the likes of Oxlade-Chamberlain and Gervinho. One of the glaringly obvious points from the game was the distinct lack of pace in attack to really stretch the man united back line. Walcott virtually ruled himself out of that role due to his campaign to be played in a central striking position. So that left us with no real options of pace on the flank. Serge Gnabry has been included in the previous few premier league squads, he is young and raw but those qualities were probably exactly what would have been required from the bench to get at Evra or Rafael. I don’t know the full details of his non inclusion and he may well be nursing an injury from the midweek game against Reading but if not maybe he should have been considered. You only need to look over at Liverpool and Raheem Sterling as proof that a 17 year old can make things happen. Gnabry would have been a good option. Aaron Ramsey has been criticized for his contribution on the right hand side but in fairness that’s not his natural position. Wenger had asked him to play a role there mainly because his options were limited. He tried but in reality Ramsey was easily contained out on the right and rarely threatened from that position. I mentioned Walcott earlier and his inclusion in the team could also been determined by his 120 min involvement in midweek along with Arshavin. Gnabry played around 60 mins and would not have been suffering from the same level of fatigue if any. Some of Alex Oxlade-Chamberlain’s real standout games last season when he was coming to prominence were in the high profile matches against both Manchester clubs. 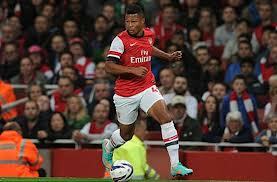 Could Gnabry have introduced himself to the watching public with a virtuoso display against united? That’s a question we will never know the answer to but some food for thought. Time for Podolski to play as a striker. At present the waiting list at Arsenal to play in the central striking position seems as heavily congested as our very own season ticket waiting list. We have players who don’t look the part scoring goals there, players who look the part not scoring quite enough; players who want to play there using their contract as ransom and then players who may get a chance due to capital one cup form. The funny thing is even when you account for the plentiful options for the position we still seem to be lacking a predatory striker that would scare the opposition and the fans would gamble all their earnings on scoring for the club at times of need. In my opinion no one striker has fully convinced in that position so far for us this season. The issue was slightly overlooked due to the number of goals being shared around the team earlier in the season. We almost believed that having a more all round team would help banish the ghost of Robin van Persie once and for all. What it all boils down to at the end of the day is defenders fear prolific strikers, the opposing manager has the conundrum of whether to pay more attention to the prolific striker or not. When more attention is made to that striker it can open up opportunities for other members of the team to exploit, if the opposing team chooses to ignore his threat then they end up punished when he finds the space to score goals. We need a striker like that, we may have that striker on our books in Giroud but he is still adapting to the premiership and right now is not that player yet. The question is do we wait until he becomes that player or explore more options in the meantime. I say there is no harm in trying the option of Podolski in that position. Can he play there? There’s only one way to find out. If my memory serves me right Podolski was tried there in our season opener against Sunderland which finished 0-0 but never graced the central role again. I feel he is an excellent finisher who would take chances if presented with them. No harm in trying him there. All the plaudits for Podolski so far this season have been about how well he protected the left hand side in combination with Gibbs (not so much with Santos). Providing good defensive cover is a nice to have but on the offensive side if he isn’t on the score sheet the German’s contribution comes into question. signed as a replacement for Robin van Persie or not playing as a striker is not an alien position to him. on assessment of his season so far he has enjoyed a good start to his arsenal career but there is so much potential for more. we have players that can play in that left hand side role so Podolski should be given another chance to prove he can play there or not. I didn’t plan for this to be a long post so I am going to cut this feature into two. I will post part 2 with more of my points tomorrow. Posted on November 5, 2012 by GambeanoSnitch. This entry was posted in Arsenal and tagged afc, arsenal, football, manchester united, old trafford, podolski, robin van persie, serge gnabry, soccer, wenger. Bookmark the permalink. Valentine’s celebrations all round for the Gunners.